Nothing can be more miserable or aggravating than being unable to breathe adequately when suffering from a cold or other congestion. Since the Northern Hemisphere is now in the throes of the winter season, the likelihood of this happening is much greater. According to a power point presentation from the Idaho State University College of Pharmacy, it is estimated that 100 million colds occur in the U.S. annually, resulting in 250 million days of restricted activity, 30 million days of lost work, 22 million physician visits, with a direct cost of $15 billion yearly. That some relief can be had through use of an inhalant is certainly welcomed news. 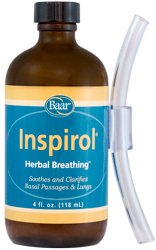 A popular remedy, Inspirol®, was mentioned in over 300 readings and recognized for its wide use for all sorts of respiratory problems: asthma, bronchitis, catarrh, colds, congestion, coughs, emphysema, hay fever, pleurisy, pneumonia, post-nasal drip, sinusitis, sore throat, and tuberculosis. While the formula varied slightly in different readings, it usually contained pure grain alcohol to which was added a number of oils (eucalyptus, pine needles, rectified oil of turpentine) plus compound tincture of benzoin, tolu balsam, and rectified creosote. With each use the container is shaken so that the fumes are released into the bottle. Then follow these directions from one reading: “Inhale into one nostril, holding the other, then into the other side; also into the throat—letting the fumes go into the lungs—not swallowing the inhalant, but inhaling the fumes, see? Hold either side of the nostril as it is inhaled in the other nostril.” (2186-1) One reading said to inhale into the nostrils twice and the throat once (1641-2). Any time that fumes are inhaled the lungs are stimulated, the fumes functioning as an expectorant (assisting the lungs to slough off excess mucus) and as an antiseptic. Another woman’s husband had a terrible cold and couldn’t get an appointment with two separate doctors because they were too busy. His wife’s boss, who knew about Edgar Cayce, happened to have a bottle of the inhalant in his desk drawer and offered it to her. She took it home, her husband “tried it a couple of times that night before he went to bed. The next day he was fine, no coughing or sneezing. I couldn’t believe it, but there he was, no cold. He said he felt fine. I told him we saved money by not going to the doctor.” A construction worker, he didn’t miss even one day of work. The inhalant has no harmful side effects, can be used as often as desired, and is sold today (with breathing tube included) by Baar.com the Official Worldwide Supplier of Cayce Health Care as Inspirol® Herbal Breathing™.